When working in Office programs such as Microsoft Word or Microsoft Excel I frequently press CTRL+S to save my progress. A few months ago that stopped working! I had to manually click the Save button to be able to save my work. I figured some other application was grabbing the keyboard shortcut from windows so I set out to find which application was intercepting the CTRL+S keyboard shortcut, or how to find the application grabbing keyboard input. This application showed me that CTRL+S was in fact being intercepted by Skype! 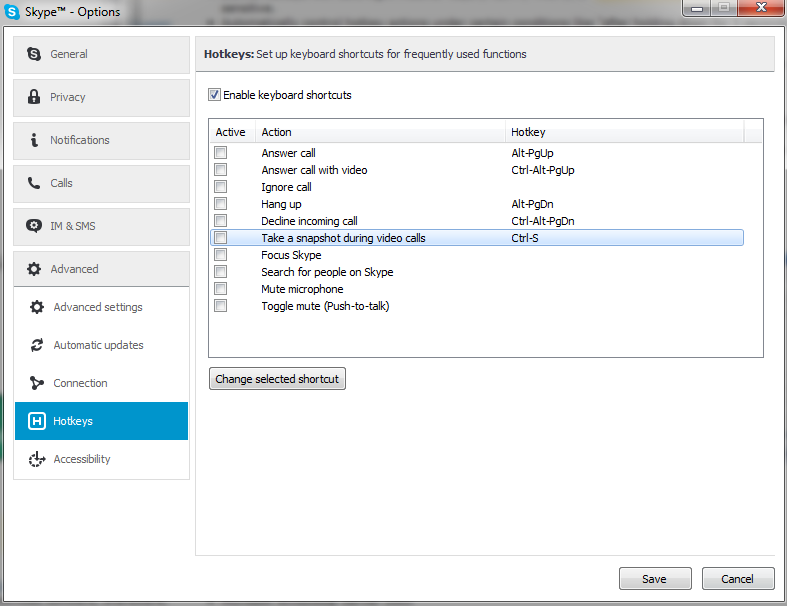 Sure enough, in Skype’s Advanced options for Hotkeys there is an option: “Take a snapshot during video calls” with a default hotkey set of CTRL+S. Unchecking the box and clicking save immediately restored my CTRL+S shortcut in all other applications! Technical note: For some reason after removing the hotkey, clicking refresh in the Windows Hotkey Explorer application caused the application to stop responding. Subsequent loads of the application also went to not responding. Still, it helped me figure out the problem.